Mr. Fujikawa is the second generation owner of Fujikawa Kouka-en nursery and is one of the most respected bonsai nurserymen in the Kansai area of Japan. He spent several years as an apprentice under Saburo Kato at Mansei-en in Omiya and has since devoted himself to the progression and development of bonsai art, both within Japan and abroad. Mr. Fujikawa’s work is regularly featured in many of the major bonsai exhibitions in Japan including the Kokufu-ten, Taikan-ten, and Sakufu-ten. In addition, his knowledge of bonsai art is expansive and encompasses all areas of bonsai culture, species, and design. 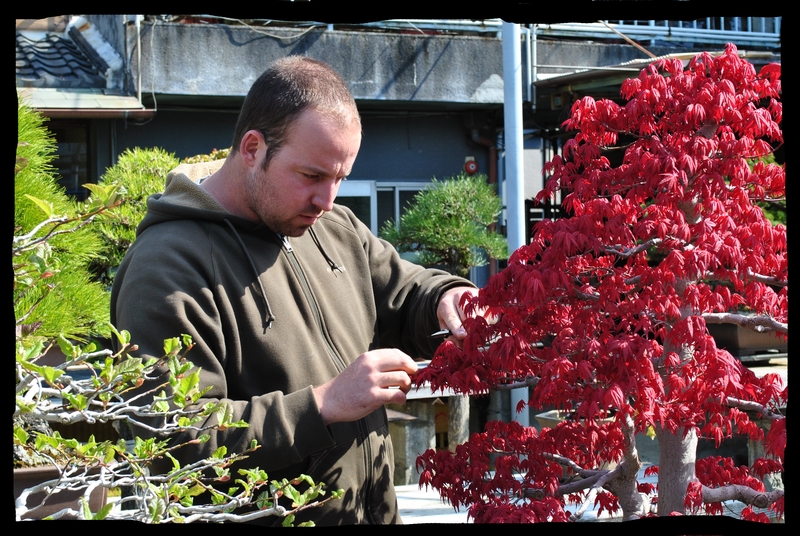 Mr. Fujikawa is the primary instructor at the Fujikawa International School of Bonsai and will work daily with students to ensure their understanding and progression throughout the course. Please click HERE to see a full interview with Mr. Fujikawa at ArtofBonsai.org. Bjorn Bjorholm is originally from Knoxville, TN in the United States, though he is now based in Kyoto/Osaka, Japan. 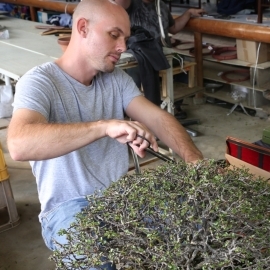 Bjorn spent several years as an apprentice under Mr. Fujikawa and is now working closely with his former teacher to expand the international bonsai school. He will provide translation services to non-Japanese speaking students at the Fujikawa International School of Bonsai as well as conduct English-language presentations/seminars. In addition, Bjorn will host tours of several gardens and temples in the Kansai area for students of the bonsai program upon request. For more information about Bjorn, please visit www.bjorvalabonsaistudio.com. 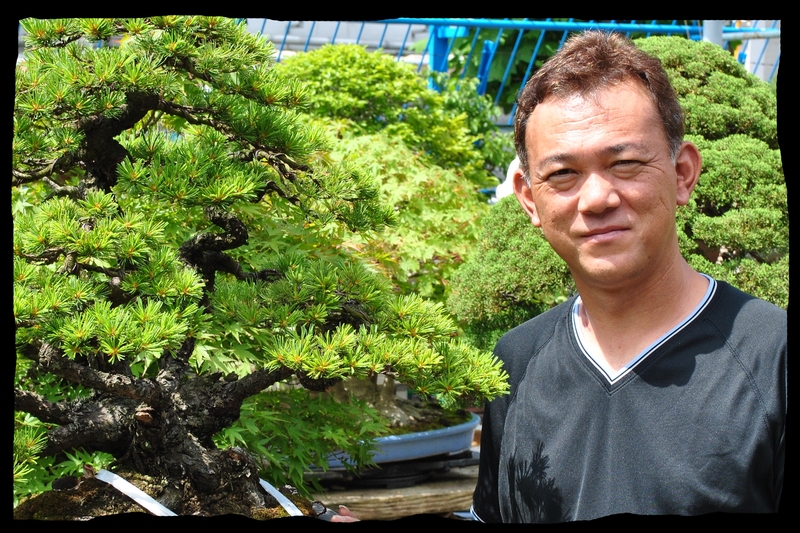 Naoki Maeoka is an Osaka-native who has been studying bonsai for nearly two decades. He currently works as an apprentice and resident artist at Kouka-en nursery and as a teacher for the Fujikawa Bonsai School. Naoki has an educational background in art and design and spent many years as a graphic designer before coming to Kouka-en. 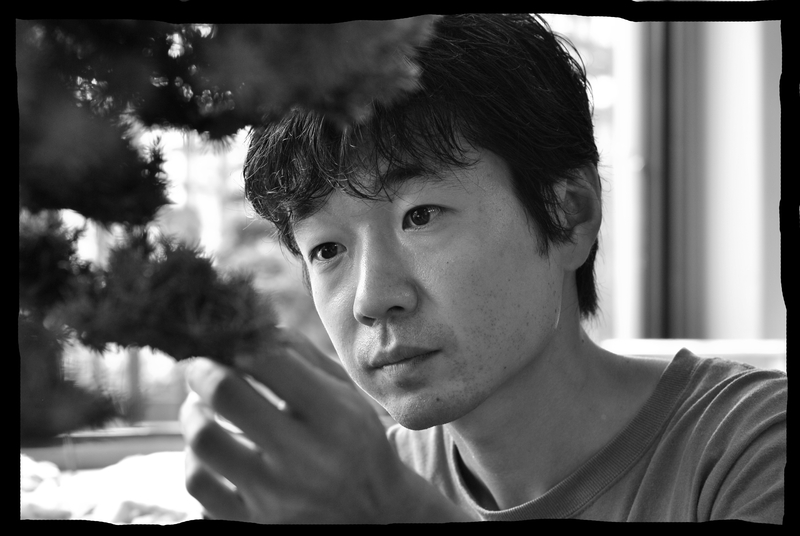 Maeoka-san is well-versed in traditional Japanese art and is also becoming a widely-known bonsai potter in both Japan and the United States. He is able assist students in English as well. For more information about Naoki, please visit Bonsai Vibe. Owen Reich is a Georgia-native and Tennessee resident who has been an apprentice at Kouka-en nursery since 2010. He received a degree in ornamental horticulture from the University of Georgia, helped establish one of the largest nurseries in the Southeastern US (Samara Farms), and is the owner of Bonsai Unearthed. 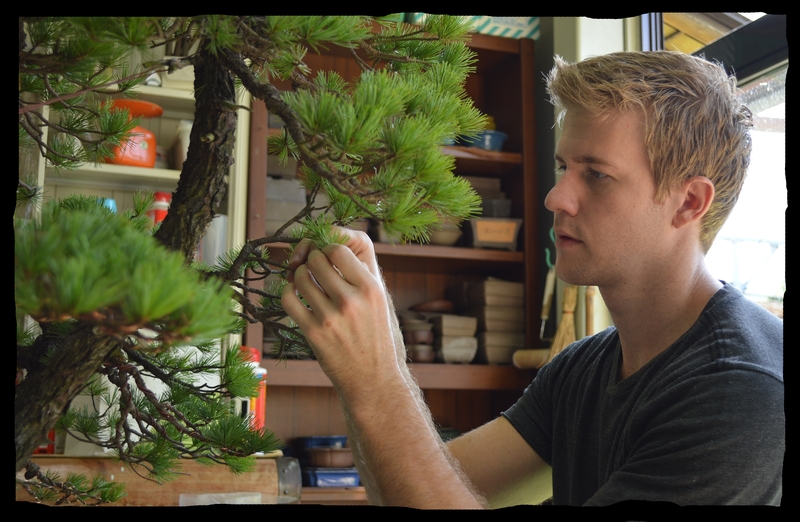 From early 2013, Owen will be based in the US but will be returning to the Fujikawa Bonsai School regularly to continue working with students. He is also able to assist Spanish and English-speaking students of the school. For more information about Owen, please visit www.bonsaiunearthed.com. David Martinez Moreno is an Artist in Residence at Kouka-en. In his vision, Bonsai is one of the most successful aesthetic manipulations of living organisms from the last centuries. His long-standing fascination for the Bonsai Aesthetics, its arrangements/displays, its relation to Nature and Art as well as with Japanese Culture led him from Mexico to Kouka-en in Japan. 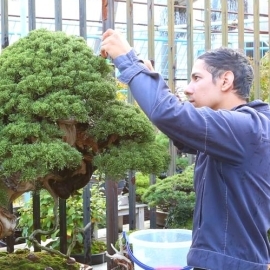 An Art Historian from the Universidad Iberoamericana in Mexico City who has worked with artists and museums, David’s residence in Japan serves the ultimate purpose of expanding and building-on-top of the cultural practice of Bonsai, as well as the overall museology and curatorship surrounding it. His goal is to contribute to the development of parameters for the aesthetic appreciation of biological beings as art; and be a part of the reflections and discussions that such a phenomena unfolds in the art world and as a consequence, in society. Dario Mader is a native of Switzerland and is currently an apprentice at Kouka-en nursery. He is also an instructor at the Fujikawa Bonsai School. the sr. bjorn speak spanish? tienen algun proyecto para america latina? Thank you for commenting. I do not speak Spanish; however, Owen Reich does. He is available to assist any students of the school who speak Spanish. Thank you! gracias por los videos que han publicado en youtube. espero algun dia Dios me de el privilegio de poder estudiar con ustedes en japon. pero si algun dia vienen a honduras o a un pais serca de este podamos aprender mas hacerca del bonsai por medio de ustedes. I’m interested to know the prerequisites to apply for learning. I have a concern, though. I am not in Japan, and hence a visa is required. Is a tourist visa something common among the current students? If not, is there really any other visa that lets you stay in japan and learn for at least an year? I work freelance, and that too online freelance. So, supporting myself will not be a problem. Just the permission/visa to stay is the barrier. ciao io parlo solo italiano come potrei fare la scuola? Hello everyone, I’would like to Konow about Italian language. Is there any italian traslator or a course in simple English ?